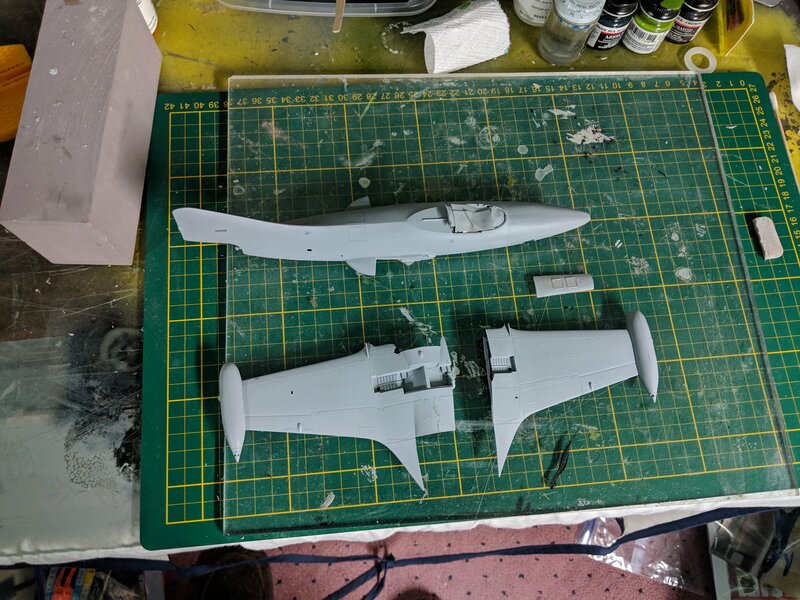 Attempting to get back to actively building with the old Monogram F9F-5P recon Panther. Planning to mark it as VC-61/VFP-61. Will have to finagle the markings from other sheets as the kit only comes with Marine squadrons. Good kit for its age. Not very many parts. Certainly not up to the detail of the Kitty Hawk Cougar or Banshee. I made 1 major error. I glued the upper halves to the lower wing before installing the lower wing to the fuselage. The instructions read to glue the bottom half of the wing to the completed fuselage. I think I've salvaged it by cutting the port wing off. It will require a little putty work to correct. Won't do that again. The initial primer work is done. Will assemble this weekend & shoot the 1st coat of Dark Sea Blue. Had hoped to have it ready for Blizzcon next weekend. Don't think I'll make it. Tough way to build it, but I have no doubt you'll salvage it and we'll never be able to tell the difference. As I recall on the Monogram Panthers, it's the intakes that determine the order of the wing assembly. I believe I altered the construction sequence with the intakes (finagled them somehow) so I could put them in the wings and then add the entire assembly later on; which allowed me to work them and blend them into the wings easier. If I remember, all you need to do is saw off those protrusions at the rear of the wing roots and you can slip the entire wing in place. Looking forward to seeing you overcome this setback! Wish I'd thought of that, Gil. It would have preserved the detail I lost cutting the wing. Nice work Nick, and good thinking on the fix. I'm sure it will look fine when done. I'm looking forward to seeing how your fix works out. BTW, I have family in Grove City. Tell them to stop by & see me at Batteries Plus on Stringtown Rd. I'm usually there Monday, Tuesday, Thursday, & Friday. We have great deals on LED bulbs courtesy of AEP Ohio. Gil, I got a 2nd Panther today. This one is the Revell Germany version molded in blue. May have to try your idea on this one. Looking forward to seeing the completed model Nick. Good idea on the fix. I’ve always wanted to build one of these. Any recommendations on a good kit? The F9F-5P kit is discontinued. The 2nd one I bought in case my attempted solution didn't work came from 1 of the etsy.com stores. I found it on Amazon. The Revell kit is very good. There's just not a whole lot of detail. It's typical of Revell/Monogram kits of the early '80's. SAC makes a landing gear set and that's about all I've found as far as detail kits go. Your best bet is to check Amazon or do a google search.